when it comes to holiday meals i actually prefer ham over turkey. justin does too as he surprisngly doesn't like the taste of turkey at all. my mom serves three meats every christmas to please guests: prime rib, turkey & ham. maybe it is the italian in her who loves to make way too much food, but that is a lot of meat. i gravitate towards her sweet honey spiral ham, it is like eating candied meat! i am always caught sneaking back in the fridge for whatever scraps are left over before bed. 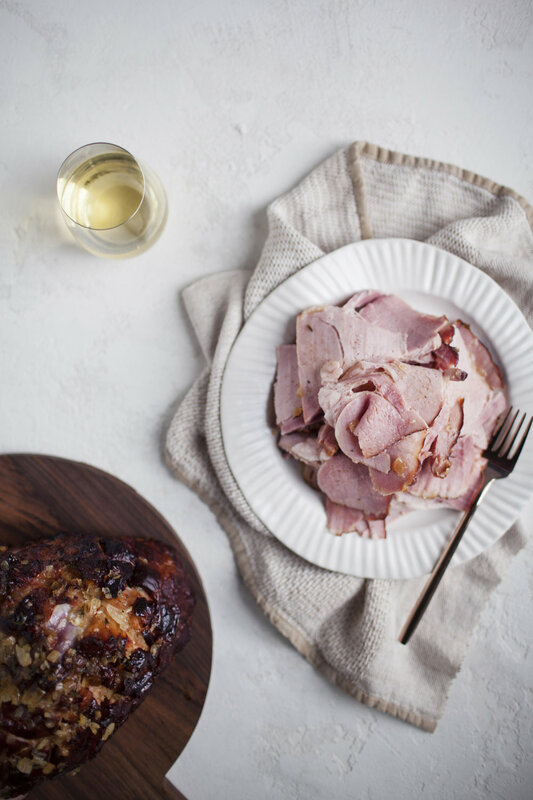 last year i made a maple dijon glazed ham & this year i will be making this honey chardonnay glazed ham. i used cambria wine's benchbreak chardonnay in the glaze to add an unexpected kick of flavour. it is one of the best white wines for both drinking & cooking with. it lends so much flavour with fruit and oak spice aromas. seriously add this to your holiday meal menu this year & you won't be needing that turkey! place ham skin side up in a large roasting pan. 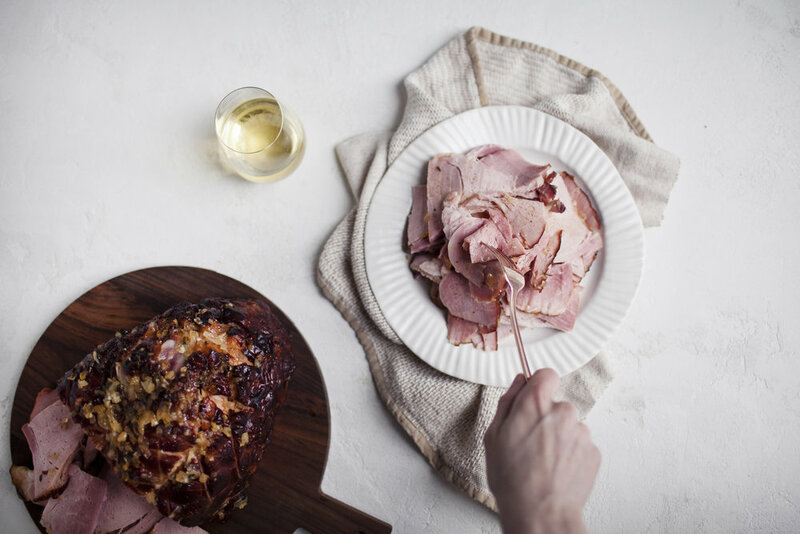 using a sharp knife, score ham in a criss cross pattern. Set aside while you prepare the glaze. in a saucepan over medium heat melt the butter & garlic. add the shallots, salt & pepper. cook until the shallots begin to turn translucent, about 2-3 minutes. 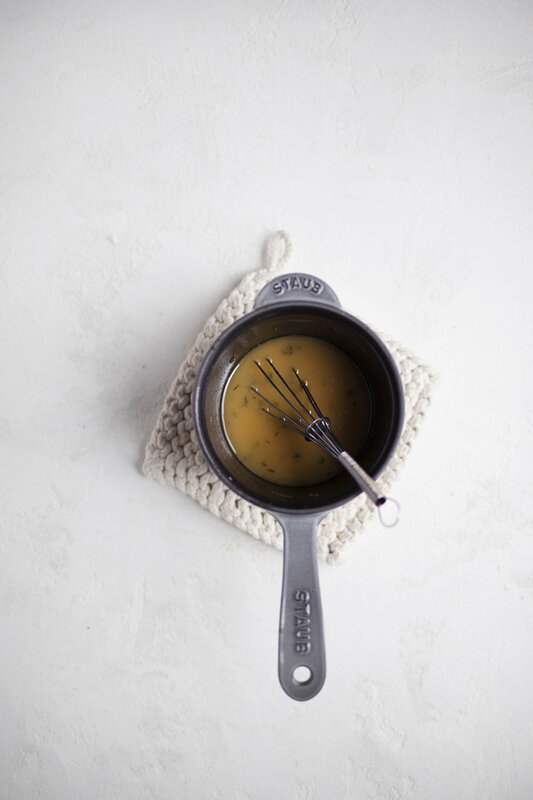 whisk in the chicken stock, chardonnay, brown sugar, honey, dijon, thyme and nutmeg. heat until the sugar has fully dissolved. pour the remaining chicken stock in the base of the roasting pan. carefully spoon 1/3 of the glaze over the ham skin. roast the ham at 325 degrees for two hours, basting every 25 minutes. alternate between basting with the glaze & the chicken stock. thinly slice and serve with a side of pan drippings.